A dwelling is a collection of rooms, but we'll stop here as the fundamental unit. The yard, The front Porch? The great room? Parking spot. Bike Storage. Bus schedules may be needed for local buses. Walk ways and gates to neighbor's yards. "Loading Dock" where things can be put to be returned to people, stores, etc. Mailbox. Package drop. Recycling station. Garbage Can. Compost bin. Family treasures (in trunk or displayed). Home theater. Dancing area. Place for sports and recreation equipment. Home library of fiction and reference. Pantry. Dining Room. Breakfast Bar. Places for brewing beer, making wine, espresso. Shop for repairing household items. Internet connection. Place for family meetings. Party place for teens. Personal Altar or Shine. Pet cemetery. Family rules. Family meetings. Time Out chair. First Aid Kit, Medicine Cabinet. Landscaping for crime and fire prevention. Fire extinguisher. Fire exit(s). Safety Rules (Officer Murphy). Emergency supply kit, including portable radio and Bottled water. Savings and Checking accounts. Jobs for all family members. Allowance. Volunteer Work. Freedom of Speech. Newspaper. Television and Internet used responsibly. 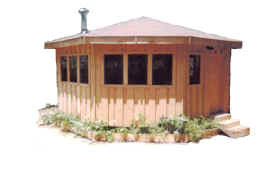 Many kinds of dwellings - from prefab to custom. Trailers, Mobile Homes, RV's, Quonset Hut, Dymaxion, Yurt, Tipi, Dome, Pyramid, ferro-concrete dome, right on up to the street of dreams. Bad Manors. Gravy Palace. Falling Water. Xanadu. Send your favorite dwelling names to me. I will compile them.